Massachusetts Attorney General Maura Healey and Juul Labs are currently arm-wrestling over kids and e-cigarettes. Two weeks ago the AG went public with her concerns about teens being the target of Juul e-cig ads, as the Boston Globe’s Jerome Campbell reported. Massachusetts Attorney General Maura Healey has begun investigating the popular vaping company JUUL Labs Inc., saying that it appears to be marketing its products to minors. “Just when teen cigarette use has hit a record low, ‘juuling’ and vaping have become an epidemic in our schools with products that seem targeted to get young people hooked on nicotine,” Healey said at a news conference Tuesday. The company’s vaping devices are designed to appeal to young consumers, Healey said, with a sleek, high-tech appearance and a variety of protective skins that make them look like school supplies. Healey’s investigation focuses on “whether California-based JUUL adequately monitors its website ‘to see how effective they are at preventing minors from accessing JUUL or JUUL compatible products.’” Campbell notes that according to a 2016 US surgeon general report, e-cigareete use among high school students spiked 900% between 2011 and 2015. The print outlet here is the Boston Herald, where this full-page ad has run four or five times in the past month. Of course the “cigarettes are for adults” is the oldest reverse-psychology gambit in the tobacco industry playbook, but why get technical about it. A companion series of ads prominently features 1) adults, and 2) the potential public health benefits for America’s forty million smokers. 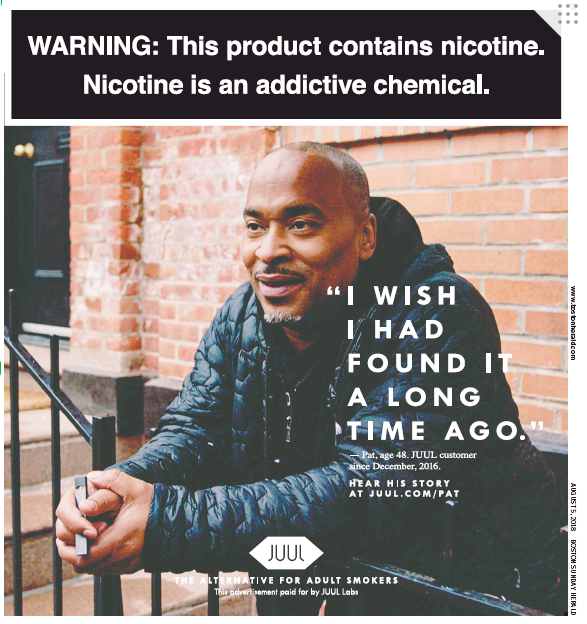 The ad points you to juul.com/pat for that guy’s story, but good luck cutting through the cyberhaze there. 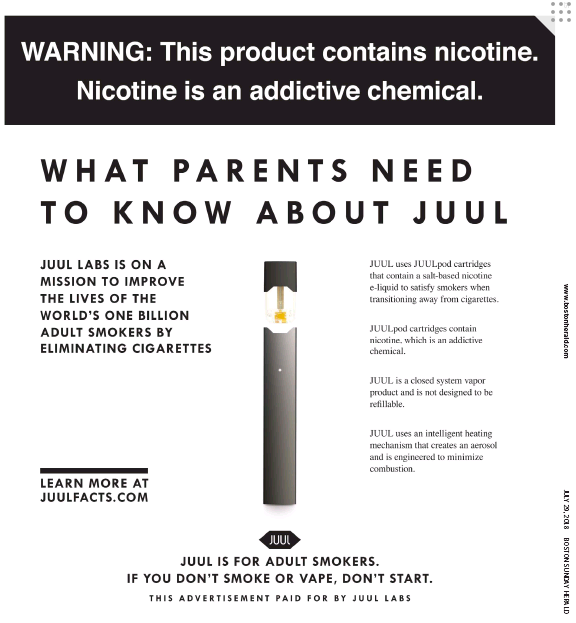 So back to the “What Parents Need to Know About JUUL” campaign, which entails “[an] initial investment of $30 million over the next three years dedicated to independent research, youth and parent education, and community engagement efforts.” It also entails this radio spot that provides parents with Juul Facts to pass on to their kids. But here’s one fact Juul Labs doesn’t mention, via this piece from Business Insider’s Erin Brodwin. 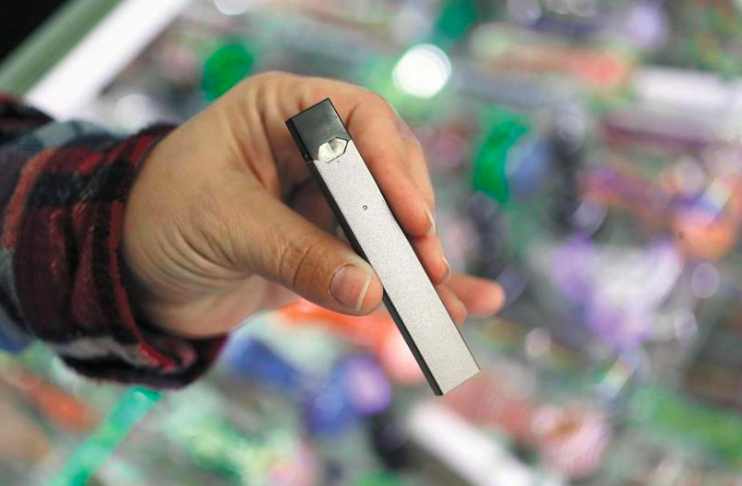 Adult customers say they find the high nicotine content as satisfying as conventional cigarettes, but the Juul also has a growing number of teen fans, whose developing brains are uniquely vulnerable to addiction. Those teens could become a new generation of smokers, researchers warn. “This is really the genie you can’t put back in the bottle,” Matthew Myers , the president of the nonprofit Campaign for Tobacco-Free Kids, told Business Insider. Or put back in the e-cig either.